Part of a 60-acre mixed use development outside of Kansas City, the Museum at Prairiefire tells a story of geology, culture and the practice of prairie landscape management through controlled burns. 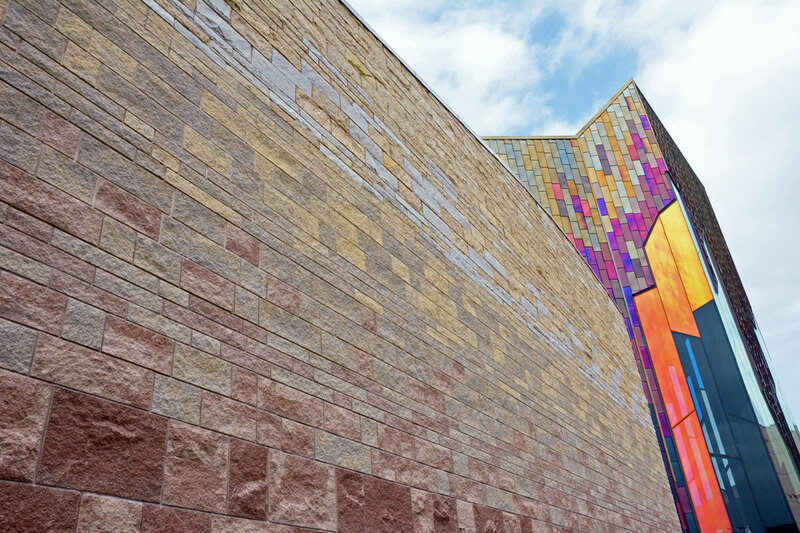 Located in Overland Park, KS, the 41,000-square-foot museum is clad in stone that represents the rolling hillside of the region alongside fiery sparks of color. The museum was developed by Fred Merrill, Founder and President of Merrill Companies, and features a rotation of exhibits from New York City’s American Museum of Natural History (AMNH), a Children’s Discovery Room, and expansive archaeological specimens. The vision of Jonathan Kharfen, AIA, LEED senior associate with Verner Johnson Inc. of Boston, MA, the museum was to reflect the story and uniqueness of controlled burns in the local Flint Hills of eastern Kansas. 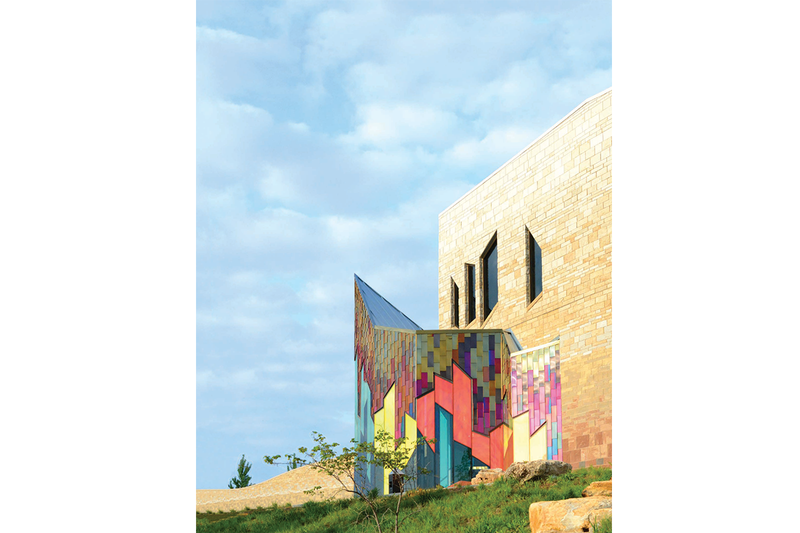 Having experienced the burns himself, he wanted the building envelope to showcase the charring of the hillsides with a gradient of colored stones, along with the colored insulated dichroic glass representing the flames. Kharfen wanted to work with a stone manufacturer that could create the colors that would achieve the desired “charred” gradient effect. 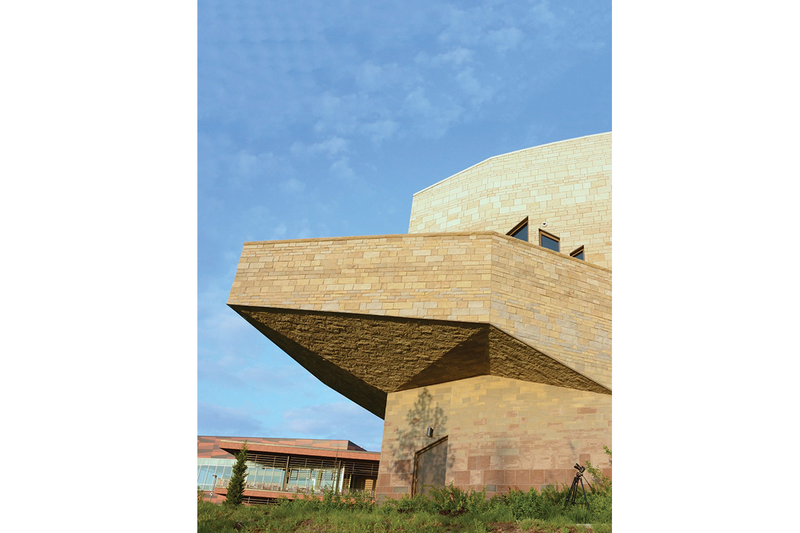 Additionally, for the second-floor Discovery Room, Kharfen wanted the balcony “completely wrapped in stone, even its sloping soffits.” With a requirement for such a unique geometric shape, matching the rest of the building’s stone façade within code tolerance posed the project’s greatest obstacle. 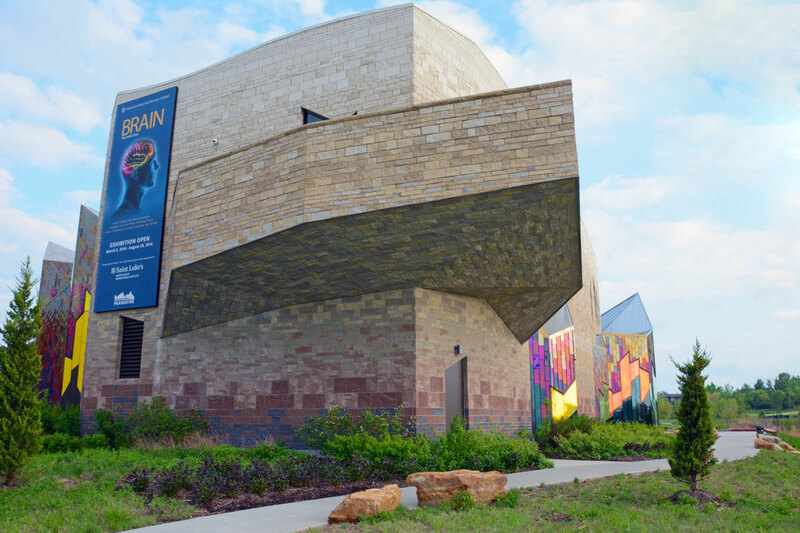 The stonework of the museum is a mix of regionally-sourced natural limestone and manufactured stone veneer from Echelon, which is a product line from Oldcastle APG, A CRH Company. The stone was set by D&D Masonry of Kansas City, MO. “We incorporated four standard Echelon Cordova veneer colors and then worked closely with [CRH] to create two custom colors,” said Kharfen. The challenge of stone on the balcony was solved with additional help from Echelon. Representatives at Echelon introduced Kharfen and Reardon to the Fast Track Stone System by Innovative Building Products, which allowed kerfed stone to sit in a lipped track. This mechanically holds the stone in place, despite the gravity load of the sloping soffit. The two long sides of each stone are secured in the track top and bottom. To make sure the sloped soffit system was safe, D&D Masonry created a mock-up in a Kansas City vocational facility. They were able to simulate how the soffit system would be installed and how the stone would sit securely in the track system. Click here to read more about the Prairiefire project on the Echelon website. There are many ways contractors can make the perfect project a reality. Besides our large selection of products, check out what solutions we can help you with.